If you want to get your resume out of the slush pile and into the hands of someone who’s ready to interview you for the job, you have to make sure it's accurate and chock-full of qualifications, skills, and experience. But sometimes that's still not enough to make your resume stand out from a sea of equally qualified candidates. We talked to a number of human resources professionals, recruiters, and hiring managers to get their advice for job seekers. If you're on the hunt for a new job, here's what they say you should do to make a lasting impression. 1. START WITH A BANG. You want to grab the hiring manager's attention right off the bat, says Rebecca Barnes-Hogg, a recruiter and author of The YOLO Principle: The Ultimate Hiring Guide for Small Business. "Today's reality is that you have less than 10 seconds to get the attention of the person who reads your resume," she says. "The first two sentences on your resume are the most important." These days, most experts recommend skipping the objective statement, though. Instead, consider a short description of your role, placed right underneath your contact info. "I like to see a very short summary at the top that gives me a sense of who the individual is," says human resources professional Jana Tulloch. 2. ECHO THE JOB POSTING. The best way to grab the attention of a hiring manager is to use their own words from the job posting on your resume and cover letter, says Lauren McAdams, a career advisor and hiring manager at ResumeCompanion.com. "There are probably a few key things they are looking for, and using their exact language on your resume is going to draw their attention," McAdams says. "Make your resume sound like it's directly replying to the job post." This is also a great way to organically add keywords to make it through the applicant tracking system, she adds. 3. THINK LIKE A COMPUTER. "Most companies have some form of automated applicant tracking system that will assign a rank to each resume. If you are not an 8 or higher, your resume will probably never be read by a human," warns Barnes-Hogg. "Think in terms of SEO and keywords." This means using buzzwords that highlight what the employer is likely seeking: words like achieved, managed, and delivered, for example. You might also list industry-specific skills—especially ones that are mentioned in the job description—where they seem appropriate. Overdo it, and it'll be obvious you're trying to game the system. You probably want to squeeze in all the highlights you can, but keep in mind that your resume should also be easy on the eyes. "Resumes are often pretty boring and repetitive," says Tulloch. "If someone wants to make theirs stand out, keep it simple, uncluttered, and highlight the important stuff. Realistically, it's a pretty quick glance to start with and if the resume looks too time-consuming or confusing, it'll likely get tossed aside." Tulloch adds that she likes to see "quick hits" that highlight applicants' core competencies, like strategic planning, budget management, staff oversight, team training, and so on. "When it comes to work history, be sure to highlight what you brought to the company and how you added value," Tulloch says. Try to keep everything included on a single page, too, says Brad Stultz, a Human Resources Coordinator for Totally Promotional. "A candidate wants to draw in a hiring manager with their resume. The quickest way to the bottom of the stack is a poorly composed and constructed resume," he says. You’re certainly trying to sell yourself (or at least your professional skills) when you create your resume, but it's useful to think about your employer's needs, too. When you know what they're looking for, you can hit on their pain points, so to speak, and give them what they need. If an employer is looking for a web designer, for example, you may want to highlight the fact that you’ve helped companies increase traffic or convert more site visitors into customers. "Resumes need to speak to what the candidate can do for the company, not what the candidate is looking for," Tulloch says. “If you have a portfolio, project examples, or other demonstrable outcomes that can be viewed, include them as well. These can be links in the resume or as a link in the email when you apply." 6. DON’T TRY TO BE TOO UNIQUE. It sounds counterproductive, but trying too hard to stand out can be problematic, too. Ironically, it's what everyone else is trying to do, says Tony Warren, CEO at BreatheSimple. “I have spent too many Friday evenings going through piles of resumes all striving to be better or different but all having read the same books on 'how to write a good resume,'" Warren says. "So heavier paper, colored paper, gothic font headings, long waffling statements like, 'I am a roll-up-the-sleeves type of person ready to get to work early Monday mornings to make a real difference.' Yawn!" Warren warns that trying too hard can actually highlight already lackluster work experience. Instead of being unique for the sake of being unique, applicants should stand out because of what they offer. He echoes advice about focusing on the value you bring to the employer. "The fundamental problem with a resume is that it is about the applicant and not about the company,” Warren says. 7. FOCUS ON WHAT YOU ACHIEVED, NOT WHAT YOU DID. One resume consultant (who preferred to remain anonymous) told us that applicants should focus on achievement instead of completion. "Sure, you've done things. But were you any good at them? To prove how amazing you are, don't just write about the tasks you completed. Instead, write about your achievements." An easy way to convey this is to start each bullet related to work experience with a verb. "For example, if you want to show that you were 'involved in making a marketing plan,' write: 'Co-developed a marketing plan that delivered $500,000 in profit,'" our source says. 8. PROOFREAD. THEN PROOFREAD AGAIN. "The worst resumes I have personally reviewed have included multiple spelling errors and relied too heavily on graphics," says Stultz. "A candidate should rely heavily on spell check and be willing to proofread their resume several times to ensure accuracy." Even better, send it to a friend who can give it a glance with a pair of fresh eyes. 9. THINK BEYOND THE WORKPLACE. It can work in your favor to get a little personal, too. Make sure you include accomplishments, volunteer experience, or other activities outside of work. "Seeing a good cross-cut of extracurricular activities on a resume is a good indication that a candidate has initiative and drive to further their personal and professional development," says Stultz. "These individuals tend to be more passionate and dedicated to their work." This also makes you relatable. If you can humanize yourself beyond Job Applicant No. 67, it'll make it easier for employers to envision talking to you in person. 10. USE THE RIGHT FORMAT. 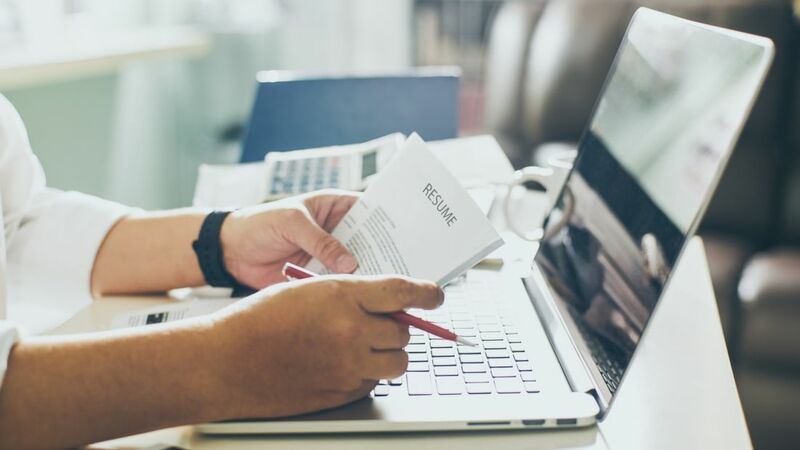 Tailor your resume format to highlight your best experience and skills, says Maritza De La Cruz, a Senior Staff Recruiter for Combined Insurance. This may mean foregoing the usual chronological order. "For example, a resume in a chronological format showcases what you have done most recently and moves backwards. A functional format more specifically highlights relevant skills and experience and may be a better format for someone looking to make a career change or with a gap in their employment history," De La Cruz says. 11. MAKE SURE YOU’RE QUALIFIED. "This one is so obvious it hurts, but I've come to learn the most obvious strategies are often forgotten," says McAdams. "It doesn't matter what the position is, from janitor to rocket scientist, how much experience and familiarity you have with a given type of work is going to be clear." Hiring managers know what they want and they also know how to spot a fake or over-hyped resume. If you're skilled and qualified for the role, an experienced hiring manager will be able to tell. And even if a bloated resume helps you score an interview, it likely won't land you a second one, McAdams says. "So be honest and specific about your skills and experience and apply to positions you will be competent with."